Some would argue that there is no such thing as gambling sensibly. Others would say that it can be a fun and potentially financially-rewarding pastime if, and only if, a gambler exercises restraint and follows certain rules. For some, gambling can become a serious addiction that ruins their lives whether it’s through financial troubles, compulsive lying, stress or depression; so it’s not something to take lightly. Next time you place a bet, consider some of the following advice. An educated gambler, someone who knows the games well, is much less likely to lose as much money as someone who dives into a game without knowing the rules. When gambling online games that you’ve played before might have slight variations or different layouts that throw of your game. Play the games for fun first, without betting any money, like poker at Bet Safe; that way you can practice and then start betting if you want to. It’s a good thing to keep in mind that certain games like roulette and slot machines are completely based on chance; while poker and blackjack, if studied well, can be slightly more predictable. There’s still no guarantee of winning, however. It’s important to keep track of how much money you are really spending on gambling. Often players will win a jackpot and think they’ve made £50 without realising they’ve spent £100 already – so they’ve made a loss. Successful gamblers will set themselves a budget of how much they can spend on an evening; and when it’s gone they stop playing. The same rule works for winning too – quit while you’re ahead. If you’ve doubled your initial money then it’s time to stop. It’s also a good idea to leave any debit or credit cards at home to avoid the temptation of withdrawing more cash out. Never gamble with money you can’t afford to lose. If you need to pay bills or buy food shopping, use your money for that and any leftover can be spend on leisure activities like gambling. Using money that’s not set aside for entertainment is the easiest way for gambling to lead to financial hardship. If you need help managing your finances to fit in with a desire to gamble, then there are budgeting apps or tools online that can prove useful. 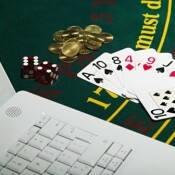 Figuring out what makes you want to gamble can help control the amount of time you spend gambling. Gambling can be a sociable activity, even online; winning a bet provides a buzz or a release of dopamine that many gamblers chase; it can relieve stress and provide an escape from ordinary life. If you’re spending more money than you can afford, think about whether you’re using gambling to replace something that’s missing in your life. If you need to relieve stress consider pursuits that don’t tend to lead to addiction or financial problems. If you have real trouble staying away from gambling or setting yourself sensible limits when you do, it’s worth seeking professional advice.